Ideally located in the heart of the World Heritage listed Daintree/Cape Tribulation National Park the Daintree Rainforest Retreat is a small boutique motel that provides a unique place to stay and enjoy all of the wonders of this very special region. 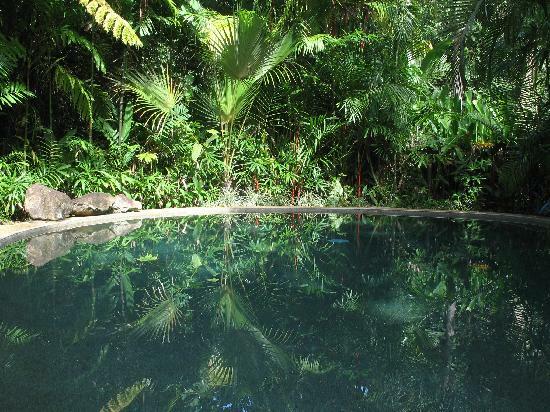 The Daintree Rainforest Retreat prides itself on being enviromentally sustainable and runs almost entirely on clean and quiet energy from the sun, ensuring that the retreat is carbon neutral. Combining a range of resort style accommodation, friendly service and a great Cape Tribulation location the Daintree Rainforest Retreat is the perfect place to go for a holiday. This affordable property also has lots of great facilities including direct internet access, disabled facilities, faxing facilities, free car parking, guest laundry, restaurant, room service, outdoor swimming pool, tour desk, bbq facilities and a landscaped garden. The retreat also has regular visits of a number of cassowaries coming to the property due to the large number of food trees located there. The pristine Cow Bay beach is only 5 minutes by car, a delightful bike ride of 15 minutes or a leisurely stroll of 30 minutes. Cow Bay boasts some fine Restaurants and Cafes all within easy walking distance from the Retreat and some will even cook your catch for your dinner. Cassowary 2 Bedroom Apartment : Sleeps up to 5 guests on 1 Queen & 3 Single Beds. Treefrog Hotel Suite : Sleeps up to 5 guests on 1 Queen & 3 Single Beds. Fan Palm Queen Suite : Sleeps up to 3 guests on 1 Queen Bed & 1 Single Sofa Bed. Gecko Queen Hotel Room : Sleeps up to 3 guests on 1 Queen Bed & 1 Single Bed. Cicada Queen Hotel Room : Sleeps up to 2 guests on 1 Queen Bed.